This past Monday I was introduced to a beautiful and spritely lady. I only barely knew her, but immediately was attracted. After only a day of getting to know each other, we became best of friends. By the second day we were having an affair that began to create memories for a lifetime. On the afternoon of the fourth day, I was beginning to feel guilty about my increasing desire to take her home. And today, I’m not with her, feeling an unexpected emptiness. By now I have your attention, and certainly Kathy is glued to the computer screen. 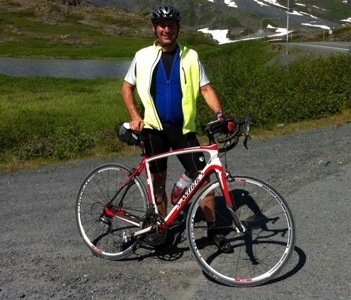 Fortunately, I’m not prone to the thrills of human affairs–I only have them with the bikes I ride. 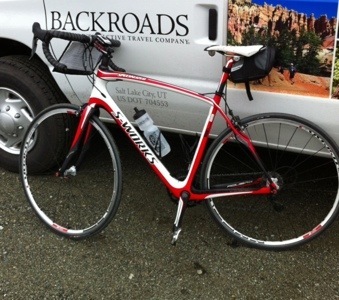 Of course, I’m referring to the Specialized S-Works Roubais bicycle I’ve been riding all week. 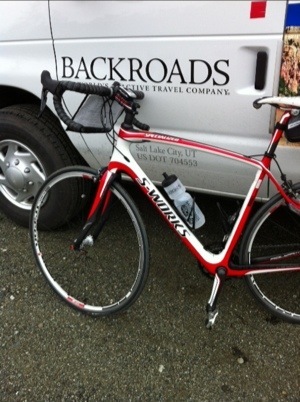 The bike was an optional upgrade for the Backroads Tour we were taking in Alaska. They promised a special experience and indeed it was. You’ve seen pictures of it in some of my earlier posts, but I’ve included a few more portraits of her in this one. Isn’t she gorgeous? She’s has a lightweight and sleek monocoque carbon body (frame), with a full Shimano carbon Durace cockpit (brakes and drive train). She has compact gearing to keep her in smooth and steady stride. While her legs are of steel for strong support, she has accessorized them with carbon spoking for ease of spinning and aerodynamic effectiveness. She purchased a special pair of shoes (tires) that made sure her ride was secure on all kinds of surfaces: dry, wet or rough. She invited me to attach the pedals I brought from home, clip in, and get in the saddle, letting me know it would be special. Her arms (dropbars) are perfectly shaped: a thin, flat profile of carbon to make our bond soft and pleasurable. And when we’re finally engaged in the saddle and moving under my first pedal strokes, she lets me know she is built for speed and thrilling performance, but willing and able to provide comfort and security for the long, adventurous days she has planned for us. She is as excited to get started as I am. Beautifully draped in a gown of reds, whites and black, her makeup is impeccably applied. On her arms and hands she is wearing black with white speckled gloves (bar tape), attractive and comfortable to hold. She is beautiful to behold, but ready for adventure. I’ve been proud to be seen with her, honored she chose me to share this week, and privileged to be bonded as we explored Her Alaska. We have had a wondrous affair. I’ve unconditionally loved our journey, gliding through every pedal stroke. I’ve looked forward to our morning coffee, preparations and planning for that days adventure. She was always waiting and ready, never shy about the rain, cold or rough terrain we might face. When we got to a steep incline, she gave her all, lending her lightweight and confident attitude to the task. Whenever I got a little nervous on a long, steep and fast downhill, or when we ran into unexpected rough road surfaces, she reached up and touched me, letting me know everything was OK.
We’ve experienced some beautiful sights and sounds along the way, and enjoyed all that this vast Alaska has to offer. We stopped to take water and food, and to capture pictures to brighten our memories. We rode with others just like her, but none were as artful or beautiful as my Alaskan Princess. Other times, we rode in solitude, deep in the appreciation of how special it was to just be alone, but together. Alaska would not have been the same experience without her. My Princess has made it unique and special: fun, exciting and comforting, all at once. I invited her to come home with me. No, that is not possible. She reminds me it can only be a summer affair, and as lovely as it has been, it was only ever meant to be for just this week. She tells me how special it has been–that I’ve handled her well, with love, care and respect. But next week she tells me, will be another to share her journey. I just hope he appreciates her as much as I have. Tomorrow will be our final date, and it will be too short. I will cherish those last few adventurous miles. At the end, I’ll say goodbye to a dear friend that helped create a lifetime of memories along nearly 350 miles of Alaskan wilderness. I will thank her for the journey, and tell her it was an experience of a lifetime. 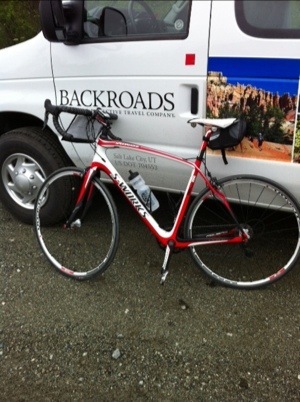 On Monday, I’ll be back in the saddle of my dearest friend of all–RedRage, my Cannondale Synapse Carbon 3. I’ll confess my affair and she will be curious. She will ask about my adventures in Alaska, and I will tell them. She’ll remind me there is always something romantic about witnessing the world through the eyes of a bicycle, and that she understands how I might get distracted by another along the way. When I’m done, she will gently remind me of the many years and thousands of miles we have ventured together. She’ll remind me she was my first love, that our memories have no boundaries, that she’ll always be there for me. I will reinstall the pedals that have connected us for all this time. We will re-settle into our comfortable relationship that will soon dim the sparkle I had for Alaskan Princess. She knows I sometimes stray, but always come home to her. By the time we have completed a few miles on our morning ride, she will have forgiven me for having An Affair to Remember. This last post definitely reveals the stress that you have been under. To think of exchanging one Carbon Lady for another Carbon Lady is a sure sign. But really I understand; this is probably one of the best rides you have had in a long time. I am sure that Kathy will understand. I love my carbon ladies–they have brought so much fun and adventure to my life. I would have missed so much without them. Redheads are the best. A friend in the Burgh rides an older version of that bike and has loved it for 20k miles plus. Frankly Lou if you trade in for a younger model I see you going for a hot blooded Italian. Thanks, I love redheads myself and if I trade, I do love the new Bianchi’s. Take care.